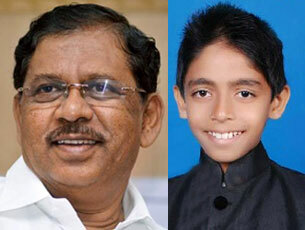 Puttur, Jan 14, 2017: Home minister G Parameshwara has come forward to bear the education expenses of Divith Rai, a class eight student of Harady Government Model Upper Primary School in Puttur taluk of Dakshina Kannada district. Divith is also a home minister – of his school. It may be recalled that Divith became popular after he approached Parameshwara to save four teachers from being transferred. He had sent a text message to the Home minister in this regard. The minister then took up the issue with Education minister Tanveer Sait and the transfers were stopped. The school is considered a model government school. On Thursday, as part of the school day celebrations, also known as Hemantha Sambrahma, it was Divith who stole the show. Divith greeted Parameshwara, and in the process, stole his heart. The minister said, “I have adopted him. I will look after his entire education expenses. The minister also donated Rs 10 lakh to the school.